Johannesburg, South Africa (November 1, 2018) — CitiXsys and EasyBiz Technologies forge a partnership to deliver a solution for retailers that improves operational efficiencies and provides greater insight into business performance. SMB merchants now have access to a complete retail management platform that integrates operational functions from back-office, to customer touch points. With iVend Retail integrated to QuickBooks, even the smallest store can achieve that! EasyBiz Technologies, the authorised local partner to Intuit QuickBooks Desktop, has forged a relationship with CitiXsys, developer of iVend Retail, to provide SMB retailers with a comprehensive, omnichannel solution that automates data sharing between accounting, point of sale (POS), and store systems to eliminate time-consuming data tasks. As a result of time saved, retailers can apply more focus on providing exceptional customer experiences. With data shared between QuickBooks Desktop and iVend Retail, retailers gain deeper insights into their business health and customers and are not required to enter the same data into two platforms. iVend Retail integrates with QuickBooks via open API, enabling retailers to manage finances and inventory centrally across their entire enterprise. The system even enables individual stores to continue transacting if the connection to the head office is unavailable. QuickBooks Desktop data, including customer credit limits, account information, payment methods, tax rules and percentages, as well as currencies, provides merchants with a complete picture of operations when analyzed and is the perfect accounting tool for existing iVend Retail customers looking for effective support. It provides step-by-step instructions for day-to-day tasks, such as creating invoices and recording expenses, so merchants can implement it quickly — and no accounting experience in necessary to do so. “A point of sale system that integrates with QuickBooks is something that our retail customers have been asking for. We conducted an extensive search for the best solution to answer their call. A partnership with CitiXsys was a no brainer, their omnichannel retail management solution, iVend Retail,gives even the smallest retail store greater control with an integrated retail platform that automates inventory, sales, customer and financial data. The days of tedious manual data entry are now a thing of the past,”said Gary Epstein, Managing Director at EasyBiz Technologies. 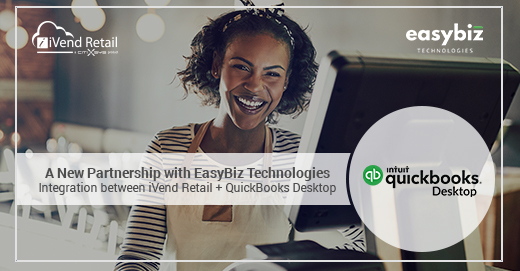 For more information on the iVend Retail and QuickBooks Desktop Integration, please visit the product page: https://ivend.com/quickbooks-integration/.